β-catenin1 is a key downstream effector of the Wnt signaling pathway. It is implicated in early embryonic development and tumorigenesis. CK1 phosphorylates β-catenin1 on Ser45, which primes β-catenin1 for subsequent phosphorylation by GSK-3 at Ser33, Ser37 and Thr41. Phosphorylation of β-catenin1 by GSK-3β leads to its degradation. Wnt signaling antagonizes GSK-3b and stablizes b-catenin1. Mutations in these phosphorylation sites, which result in the stabilization of β-catenin1 protein levels, have been found in many tumor cell lines. 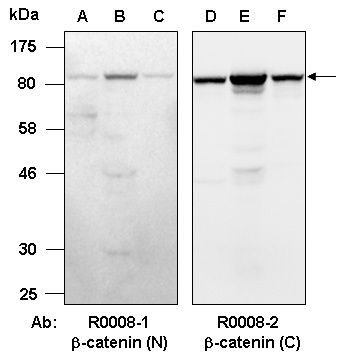 Rabbit polyclonal antibodies were produced by immunizing animals with a GST-fusion protein containing either the N-terminal [b-catenin1 (N) (R0008-1)] or the C-terminal region [b-catenin1 (C) (R0008-2)] of human b-catenin1. Antibodies were purified by affinity purification using immunogens. antibodies at RT for 2 h.